We at HANA could have taken a more secretive approach at the risk to not even come close to humiliating ourselves. But we opted out of doing it that way. Instead, we decided to publicize our POOL ATTACK BUYCOTT which begins tomorrow and hopefully lasts and grows for many weeks to come. The plan is to pick one race a week and show the powers that be that we have unity and strength in numbers. 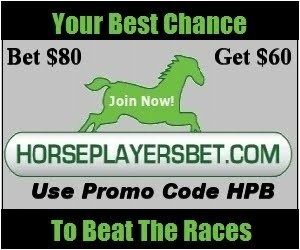 So tomorrow, March 31st, 2009, HANA has advised its close to 700 members that we hope they join in and bet on the 6th race at Will Rogers Downs. Personally, not only have I not made a bet at Will Rogers, but I've never seen a race from there in my life. I had to check out where the track is located. I found out it is in Oklahoma (coincidentally that is where American humorist Will Rogers was born as well). I then had to look to find out where Oklahoma is on a map. I did my research, and being a team player, I'm in. Unfortunately, HPI doesn't take bets for Will Rogers, so many Canadian HANA members will not be able to participate in this one. I do know many big bettors in Canada though that have accounts through friends and family in the US, plus there are a handful of ADWs which take Canadian customers as well (Sorry WEG, you are not the monopoly you think you are). I wouldn't be going through HPI regardless, because their rebates are very small, and since I live in the Fort Erie home market, I don't even qualify for their piddly rebates anyway. HANA has negotiated for lots of free handicapping help for the 6th race tomorrow at WRD, including Platinum Plus Past Performances (thank you Craig at Trackmaster). I'd like to clear up some misconceptions about what we are doing and why. This (hopefully) will be horseplayers showing the ability to act cohesively as one. This is NOT a donation. We ask that Each player handicap and bet the race just as you normally would in your routine betting. Initially wagering amounts were talked about and it was suggested that a range of somewhere between $25-$75 would be optimal. However no one should feel obligated to bet outside of their comfort zone. Handicap and bet the race as you normally would. A wager of any type and amount on this race will be appreciated. It is hard to say what a success for HANA would be, but I'm pretty confident that the Will Rogers racing execs will be saying "what the heck just happened" after the race, and "I wonder what it would take for this can be an every race occurrence." Doing quick handicapping so far, I've come up with the 10 and 3, but there is still plenty of time to look at the race more closely (it goes off at approximately 5:30 tomorrow). Bill Finley has just given the Will Rogers BUYcott idea some excellent publicity. Hey, he could have mentioned HANA (Horseplayers Association of North America) in the article. I'll forgive him this time. "If track managements watch this grow and every week the amount we bet grows, they're going to have to say, 'Hey, we better pay attention to these people,'" said (Mike) Mayo, a horseplayer residing in the Dallas area. "All we want is to have people sit down and listen to us." He says that if horseplayers don't flex their economic muscles tracks will never take their problems seriously. "The problem is track managements think we're all a bunch of degenerates who are hooked like druggies and alcoholics," Mayo said. "They think we can't give it up and are just going to keep coming back. Well, there are a lot of people who are giving it up or betting a lot less than they used to." Terry Jordan only had 30 wins at Woodbine in 80 starts last year, and only another 35 wins from 115 starts at Hastings. Regular readers know how I feel about any trainer hitting at over 18%, let alone 33%. But I don't think Jordan uses anything that has tested positive, since to my knowledge, he hasn't had a positive I can remember (though it is hard to get that kind of information since it isn't available on the internet no matter how much one searches). Lets just say Terry Jordan is a Super Trainer, able to train much of the time from long distances, almost telepathically. His program is superior to the training program of almost every other trainer in Ontario by a country mile. And his British Columbia bred horses are also superior to the Ontario, Kentucky, and Florida breds that are all over Woodbine's backstretch. He might just be real lucky in that he found the only owners in horse racing who only care about winning races. Or maybe he has found the secret to training horses, a secret that no other trainer knows about. Is it April Fool's Day yet? Almost. Perry Lefko is covering the Simon Husbands trial. Simon Husbands faces a year suspension for a questionable ride on November 30th of last year. Check out the coverage here. I rechecked the times for the day and that race was very very slow, not only for the class, but also based on the past performances of the horses in that race. It was the third race and it went in 1:27 (the class was maiden 3 up 25,000 claiming). Two races later, 2 year old maiden 25,000 fillies went the same distance in 1:26. It should have been the other way around. That is just one example for the day. There are others. 7 furlong races went pretty fast that day, except for that one race. I also viewed Bug's Boys second last race, and I didn't see the horse flatten out because of the whip. He seemed to flatten out well after initially responding to the whip. The ORC should be investigating the betting of the race. It has all the earmarks of a boat race, though it could all be coincidence. For triactor wagering, the required number of separate betting interests has been reduced from six to five. For superfecta wagering, the required number of separate betting interests has been reduced from eight to seven for all races other than stakes races. No change was made to the number required for stakes races, as the required number remains seven. The Board authorized for public notice two proposed regulatory amendments to reduce the number of wagering interests that must be scheduled to start at the time the wagering pools open in California for trifecta and superfecta wagering. Rule 1979 (Trifecta) currently requires six wagering interests. The proposal is to reduce that required number to four. Rule 1979.1 (superfecta) currently requires eight wagering interests. The proposal would reduce that number to six. Racing associations and fairs would have the right to not offer these bets. I know that some readers will say that they like more choice and think this a good initiative. But the reality is that superfectas and triactors have the highest takeouts going. They are bankroll killers to those not cognizant of takeout (which is most people, who, for example, have no clue that Woodbine charges 28.3% takeout on triactors. I don't blame the average gambler for betting on triactors in 6 horse races. It makes sense that when you gamble you might be inclined to hit what might be the biggest payout available for a certain race. But this new rule, takes advantage of the players in a very big way. It wasn't too long ago that during the first Breeder's Cup, those in charge decided to put a $5 minimum on exactor bets. Why? Because they were worried about killing their customers bankrolls too quickly. Small players would be forced to stay away from the exotics, and wind up cashing more by being forced to bet only win, place, or show. Nowadays, organizations like Woodbine are interested in one thing: Getting as much money from the player every single day, without caring if the player comes back because of their gambling experience. This new rule is guaranteed to tap out players more quickly. The monkeys who run the WEG zoo just don't get it. A regime change is desperately needed. I honestly don't know what is holding them back from charging 28.3% on all bets. I think they don't even get why slots are so successful. It is the lower takeout. Slot players don't know or care about house edge, but slot operators know that if they raise the edge to more than 11%, people lose too quickly and are prone not to come back so readily. If only horse racing execs would understand the same. The Thoroughbred Bloggers Alliance also has a Facebook page. Daryl Wells Jr. reports that Fort Erie has 500 stall applications already. The track will be open for training early in the week. They need to add more to the bottom claiming races and eliminate allowance races and claiming races above $14,000. If an owner thinks their horse is worth more than that, prove it, and run at Woodbine. By upping the purses for bottoms, they are sure to attract quite a few more horses, especially with Ohio being in the dumper big time right now. Canadian bred claiming races could draw many horses from across Canada as well, plus they would be a good out for many Canadian owner/breeders. Equibase is having a free contest today (Turfway Handicapping Challenge). The winner gets $500. Looks like a lot of chalk. Three Account Betting Companies Given Notice In Maryland Outside of the Preakness, I don't know very many people who even follow Maryland racing. Especially after increasing takeout recently, I don't see the circuit being missed at all. I'm not for tracks closing, but if they must, Maryland is a perfect place for it to happen. The shift continues from live betting to betting on the internet. The only way for horsemen and tracks to take advantage of the shift (and not continue to lose out on the shift) is to start their own ADWs. Vet argues for horse slaughterhouses. Calls it the lesser of evils. Meanwhile, prices are up over 30% for slaughtered horses. Jeff Platt, President of HANA interviewed by Case For Race Anyone still kicking the tires about joining HANA should read the interview. No gambling means no horse racing. End of debate. Magna Entertainment Writes Down $136 Million In Assets Well duh! I guess the assets are really less than the liabilities after all. Isn't that why they went into bankruptcy protection? Since Fort Erie has survived for at least one more year, and there is bound to be quite a few empty stalls at the Fort thanks to the late start, I think it is important to inform owners in Ontario and perhaps in the United States what the real costs are to own a thoroughbred. I did a post last year comparing the difference between training a race horse at Woodbine versus training one at Fort Erie. Prices haven't gone up very much to my knowledge over the past year, so the numbers quoted are most likely very close if not right on. If I'm way off on anything please leave a comment and I will correct it. I'm going to make some assumptions here. Your horse trains for 8 months in the year and races 12 times, for 4 months is your horse is resting at a farm. Also, your horse is Woodbine caliber and runs 11 times at Woodbine and once at Fort Erie. At Woodbine, trainers charge between $60 - $110 per day. 60 bucks and 110 are very rare. The bulk of trainers charge $70-75 a day. At Fort Erie, trainers charge between $40 - $60 per day. The bulk of trainers charge $50 a day. At Fort Erie, some trainers will offer "the deal." The typical deal is where the owner buys the horse, and the trainer is responsible for all or most of the bills in return for half the purses, and half the equity in the horse once the owner gets his or her purchase price back. For a trainer, this deal is a killer for them unless the horse makes at least $30,000 for the year. Trainers who take deals on cheap horses are usually desperate, and you have to wonder about their foresight. The only way a deal makes sense for a trainer today is if the horse is competitive at a claiming price of $16,000 or greater. Remember, these are estimates. Trainers also bring capital investments to the table, some bring a lot more than others. That being said, they could save money by using a hot walker machine, for example, but it cost the trainer to buy the machine. Some have "magical" blankets too. The trainer can also save on feed by buying it off the track in bulk, but they could also add supplements which may or may not appear on your bill as well as over the counter meds. I have always contended that the 10% is what the trainer is entitled to. If he or she wants to make money in the morning, then they should rub a horse or two. 8 months of training and 12 races will mean about 8 pairs of shoes. At Fort Erie, the usual cost is $100 a change. At Woodbine it is around $120-$125. Most farms charge between $15-$25 per day. So lets say the typical owner pays around $600 X 4 months per year. Many trainers will charge an additional 1% for at least a win on a training bill so that at least the groom will get a stake. Typically, many trainers pay $50-$150 for a second as well to the groom (the owner is usually charged). So a typical owner of a Woodbine horse with a 12 starts a year (lets say 2 wins and a second), will pay an additional $700 in stakes. Some trainers will add on tack charges or over-the-counter meds onto your bill. Most don't charge for this. This means your horse needs to make around $30500 a year just to break even. And at $75 a day, the owner needs to make $32,000 a year to break even. This means your horse needs to make $26750 a year to break even. Remember, you are the owner, you are doing the trainer a favour by choosing to do business with him or her. Don't forget it. If any trainers want to quote their exact prices, feel free to email me at cangambleblog@gmail.com and I will add the information on this blog post with your permission. The following couple of videos basically sum up the deal. The main speaker is Jim Thibert of the EDTC of Fort Erie. Please excuse the shakiness. I was standing while holding a digital camera and I either had too much coffee or not enough coffee (I'm not sure how that works anymore). The EDTC offered $35 million ($33 million of which they don't have) to purchase Fort Erie race track. A non refundable deposit of $2.25 million was handed over to Nordic Gaming. $1.5 million came from the $2 million the government foolishly handed over to the EDTC last year to do due diligence on the $300 million dollar smoke and mirrors expansion project. They managed to blow half a million of it in almost no time. $500,000 came from the HBPA and $250,000 came from the Town of Fort Erie (lets put it this way, no live racing most likely means no slots which means no $1 million the town gets from slot revenues). Nordic Gaming is willing to take back a mortgage on the remaining $32.75 million if the deal actually happens, as long as the mortgage is guaranteed by the Government of Ontario. The Letter of Intent is good for 90 days. In other words, the EDTC has 90 days to convince the government that they can 1) Justify the $35 million price tag (LOL), and 2) Show that they can make mortgage payments while not losing money each year on top of that (something Nordic claims they haven't been able to do for the last 3 years). At the end of the 90 days, if the mortgage can't be guaranteed, the deal is over, but Nordic must still race to the end of October. In return, they get a free $2.25 million which is probably closer to the $3-4 million in losses they are claiming to lose of late each year. In other words, Nordic caved because they probably don't lose $3-4 million a year, and they knew that no racing means no slots and that if they lose their racing license, they would have a very hard time getting it back. In other words, the joint would be very close to worthless. Hats off to Sue Leslie especially, of the Ontario HBPA, for working diligently on getting this project together, and Jim Thibert for at least being whimsical enough to come up with this deal in the first place. It appears that the main politicians Kim Craitor and Tim Hudak did next to nothing really to make this particular deal happen, but somehow I expect them to take a lot of credit. Meanwhile, the EDTC which has claimed from day one that they don't understand racing very much, though Thibert said his knowledge has increased of late, has hired a consultant firm to look at the Fort Erie books in detail and to make recommendations going forward. He emphasized that he is not accepting tenders for the consulting firm, so look for nepotism to weigh in heavily in the firm he decided to go with. This isn't good, because what they need right now is a consulting firm that understands both horse racing and gambling, and even the gambler's psyche. Horsemen collectively don't understand the bettor, or that without the bettor there is no business (and yes, bettors can and do go elsewhere). And most business execs have no idea in regard to what makes today's gambler tick. Thibert did say that it was going to cost a lot for the consulting (where is the money coming from?). They will be looking to piece off a lot of the unused property to help pay the mortgage, which in the end means they will have less land and probably owe about the same amount more or less when the dust lands. They are still banking on "lending" Woodbine 200 slots, while expect the OLG to change their payment schedule on those slots (where the track/horsemen, the OLG and Woodbine get 1/3 of the net each. Right now, the OLG gets around 77% of the net.). They don't even know if Woodbine would go for the deal, and extra slots only means more potential money if a patron actually leaves the slots disillusion that he or she couldn't lose money because every machine was taken. More slots for Woodbine, most likely doesn't mean that the bottom line of money lost by customers would increase, even if the slots are at full capacity. People stay and lose what they were going to lose regardless of capacity in most cases. More slots doesn't means more money lost by customers. In fact, casino gamblers are more eager to play if it looks like a machine to sit at or a table to sit at looks hard to come by. If the OLG is going to make concessions, the realistic one is to increase the percentages Fort Erie gets from 20% to 30-35%. In return, Fort Erie can easily give up 4-500 machines. Again, a separate case can be made for Fort Erie being Ontario's only other thoroughbred track. Bottom line, the track isn't worth $35 million. I had to laugh when Thibert calls himself a businessman, and also stated that in these rough economic time, it is a good time to buy. A real businessman takes advantage of these times. Sure it is a good time to buy....IF THE PRICE IS RIGHT! You don't put an offer on the table to satisfy the maximum a seller is willing to accept. With more tracks bound to come on the market thanks to the Stronach fiasco, Fort Erie is worth even less today than it was a few weeks ago. The business allegedly loses $3-4 million a year, and the land isn't worth very much at all.....maybe $35,000 an acre on average TOPS (which means the land is worth $12 million if the right buyers came along). Fort Erie can't even half fill an indoor mall with businesses, and I don't see demand going up in the near future. In fact, a lower amount was allegedly accepted by Nordic years earlier when the business was breaking even. But the deal fell through because Nordic wasn't doing as well as they originally stated they were doing. 90 days will come and go. Nordic will get much of the money they originally looked to extort in the first place. At that time, new offers will be allowed to come in for the track. It is to everyone's best interest that this deal doesn't happen, even if the EDTC were to come back in again, the amount offered should be at least cut in half. The horsemen and the tracks future though will be in doubt for 2010 and beyond, until Nordic decides to sell the track for a fair price. Fields will be short this year, and since Fort Erie's track takeouts are astronomical, I don't see very much betting on their product. As a representative of HANA (a horseplayers group that collectively puts through between $50-100 million plus a year in handle), I wouldn't even try to convince the membership to make even one bet at Fort Erie, unless it was done at a rebate shop that gave considerable rewards. Fort Erie ranks 55th out of 56 tracks by HANA. Only Assiniboia Downs rated lower when it comes to bettor friendly tracks. Check out Fort Erie's track takeout and compare with other tracks here. Fort Erie needs to get rid of allowance races so that they can give more money to lower claimers, so that owners have a chance to make money or at least break even. If a horse is worth over $14,000, send it to Woodbine to race and see if you are right. They also need to cut track takeout, so that gamblers will last longer, and perhaps start spending more time handicapping and coming to the track, even bringing friends and family. They also need their own ADW, so that they can market racing to their home market of 400,000 people. In the real world, there has been a shift which will not change, bigger bettors are betting mostly from home. See also, Fort Erie Back At The Starting Gate, Nordic's press release, Odds Still Unclear on Fort Erie's Survival, Fort Erie Racetrack Survives Again, and Racing To Continue at Fort Erie. Article on Derby hopeful Patena. Bill to prevent takeout increase in New York passes. Another small victory for HANA. It is possible that Belleville will run summer racing this year at the old track while the new one is set to open next year. Horseplayers speak with their wallets. Thank you Standardbred Canada for acknowledging HANA. "Details of an agreement between horsemen, track owner Nordic Gaming Corp. and the Town of Fort Erie's economic development arm are scheduled to be announced at a news conference at 9:30 a.m. at Bridgewater Country Club." Please check the HBPA website Thursday morning March 12, 2009 at 8:30am regarding the status of live racing at Fort Erie in 2009. Please find below a media advisory for your information. Please check back with our website, frequently, for more information. Before reading the Buffalo news, one could only think there was going to be a positive announcement, after all, they have until March 16th to negotiate. And why make an announcement at a Golf Club if it was going to be negative? According to the Buffalo News story, Fort Erie will run 78 days, which means a full season like last year. Interesting. 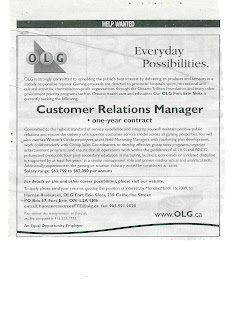 OLG in Fort Erie has advertised for a Customer Relations Manager. It comes with a one year contract. I'm wondering if the contract is automatically terminated if there are no customers. Nordic has until March 16th to announce whether or not there will be racing at Fort Erie in 2009. Their ability to run as a racetrack terminates March 31st if they state there will be no racing. As stated previously on this blog, I can't see how the slots will be allowed to operate without live racing. It would be a terrible precedence where a track can say they lose money overall because of live racing. This opens the door to many tracks in Ontario to shut down their track operation and keep the profits made on slots. So is the fact that a Customer Relations Manager is being sought a positive, do they expect live racing to continue? Or does this mean that the former CRM left the ship and the OLG is filling the position by law? Or does it mean that the OLG will keep slots going regardless of whether live racing in Fort Erie takes place? Nordic would love it, if they just had slots. They would be making a profit. Ongoing negotiations are still going on. It is approaching the 11th hour however. Nordic is impossible to deal with it seems. And the government hasn't helped because they've put Nordic in a power position by not announcing that slots would officially close without live racing. Is Woodbine waiting in the lurk? Is it possible that they can come in and lease the business operation for at least 2009? Maybe Eugene Melnyk can come in and buy the place, and change the name to some street in the Bahamas. Of course, the OLG can get racing to go for the foreseeable future by upping Fort Erie's take from the slot revenues. Kentucky drops bills that would increase takeout. Beyer article on Magna bankruptcy. Stronach might have had good intentions, but he was a terrible visionary. And now he left the racing industry in a carpet bombed state (my words, not his). The Business of Horse Racing makes a good case to show that Stronach is still not letting go. Far from it. What the bankruptcy of Magna Entertainment really means. For a lot more on the bankruptcy, go to Equidaily and scroll to around the middle of the page. Ray Paulick has details on the creditors and also mentions that major MID shareholders aren't too happy with the go forward plans. Business likely to struggle badly in a recession? Especially those involved in a dysfunctional industry to begin with aka horse racing. Turfway cuts purses. Low field size, brought on by low purses to begin with, the likely culprit. Another chain reaction that wiped out most of the field occurred yesterday at Aqueduct in the second race. Only two of seven horses in the field wound up crossing the wires for parimutuel purposes, which mirrors what happened in a harness race at Woodbine Monday night (see my last post). I hate looking at these things. I can only watch them once, and barely once. But most people want to see these things at least once. Morbid curiosity perhaps? The same reason many people watch stock car races? I took psychology in university, but I forget why we seem to need to look at this stuff. As for me posting it, I had second and third thoughts about it. This definitely doesn't do the sport much good, even though there is an old saying that any advertising is good advertising. The Eight Belles tragedy proves that statement wrong. I'll admit, I want this blog to be read. I don't make much money on the blog, but I do want my main message about dropping takeout and growing the game to read by as many people as humanly possible. This is the main reason I decided to post the video. It is the main reason I set up a new Youtube Channel as well. In fact, by putting up the harness accident from Monday night, I have so far received over 10,000 hits at Youtube. I'm not thrilled with many of the comments that criticize horse racing for being cruel, but it is better to know what the industry is up against so that it can be dealt with. I don't want to beat my chest too hard, but I'm sure HANA has had some sort of influence in this decision, though the reasons cited makes sense as well. I still think the law will go through though. February handle down 11%. The game is dying, but the racing execs are starting to get it I think. They know they have to change the pricing of betting, but will they, and is it too late. Pull The Pocket busts some handicapping myths. Good riders waiting around for a late mount doesn't mean much. Baymount Inc. provides fiscal update Hotel and water park on the way? No horses were put down. For an update click here. I just have one question though. There was at least one horse that could have crossed the wire third. I'm not sure if he did, but why didn't he get a third placing? They wound up paying the triactor off using the first two finishers with an all. And since it was a $55,400 purse, the third horse would have stood to make at least $5,500 (I'm not sure what the jugheads payout to the third finishers exactly). "Horse racing needs to find ways to build its business and needs to take a harder look at things like exchange betting, proposition betting and rebates. Times have changed and they are tough. The game needs every betting dollar it can get its hands on. Rebating works, and it needs to be supported." Woodbine came in higher than I would have liked. Going by takeout alone, they wouldn't have cracked 50, but because they offer all sorts of wagers, and their field size is on the high side, they wound up in the middle of the pack. Fort Erie, mostly thanks to their ridiculously high takeout on exactors (over 25%), wound up next to last. Their field size last year wasn't the greatest either. If availability was factored in, Fort Erie could have scored higher. Also, Fort Erie is one of the only tracks that makes their live videos free to everyone. Make all checks payable to: "Horseplayers Association of North America"
No shocker as Magna Entertainment gets delisted from Toronto Stock Exchange. Jockey Club Fact Book for 2009 is now available on-line. The parimutuel handle chart is really ugly. Take whales and rebate shops out of the ball game, and horse race betting is lucky to be on life support. Hats off to CDI for implementing a whole slew of safety and welfare policies. Rankin was a potential whistle blower who was threatening to bring down the Ontario harness game when he was shot dead at his home 2 years ago. A $50,000 reward has now been offered for information that leads to the arrest and conviction of the killer. Watch the CTV story here. It is less than 2 weeks before the official sign goes up on no racing at Fort Erie in 2009. Hopefully, the government will not let it happen. They can easily stop it by changing the amount that Fort Erie gets from slot revenues if a sale can't be worked out.